Kriging methods depend primarily on your data. 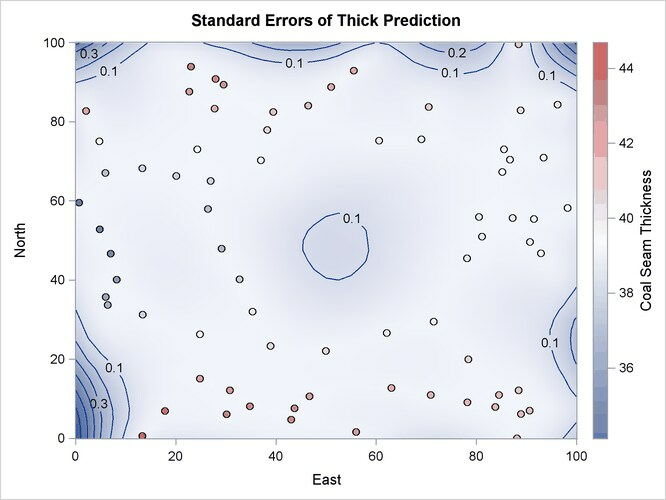 The quantity and quality of your observations are important factors in minimizing prediction errors and increasing accuracy in your prediction analysis. A typical aspect of data quality is measurement accuracy. In principle, the accuracy level of your data is not a parameter in kriging prediction; kriging assumes by definition that your data are perfectly accurate (hard) measurements. Whether you accept this assumption depends on your application. For example, an instrumentation error of 1% in the data values might be regarded as considerable in one case, whereas the same level of uncertainty might be trivial within a different framework. Your experience and judgment are crucial when you consider whether observations in a data set might be too noisy for kriging predictions to be useful. A second aspect of data quality involves the spatial arrangement of your observations. You need to have a sufficient number of observations in order to perform spatial prediction. Also, a key element in minimizing prediction errors is an adequate sampling density. Interpretation of the expressions “sufficient number” and “adequate sampling” is again case-specific. 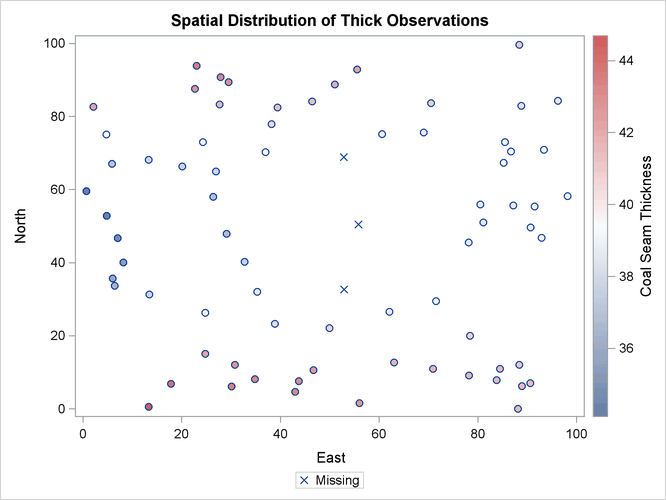 In any event, you want enough measurements so that you can deduce the underlying spatial correlation in the working domain; see also the discussion in the section Choosing the Size of Classes in the VARIOGRAM procedure. 51.0  88.8  42.0  52.8  68.9     . 52.9  32.7     . Note: Here you assume prior knowledge of the correlation structure model, because its parameters are based on the complete thick data set. A covariance model extracted from the incomplete set with the missing values would be a covariance model coming from a different data set; hence, it is likely to have different parameters. The number of observations table indicates the three missing values in Output 49.3.1. Output 49.3.2 is a scatter plot of the modified observed data. The SHOWMISSING suboption produces marks in the observations plot that conveniently indicate the locations , , and of the missing values. Consequently, Output 49.3.2 displays an extended area with no observed Thick values in the central part of the domain. Predictions at grid points with few neighboring data points rely heavily on the underlying covariance structure. The covariance model has a range of about 30,000 feet, which suggests that within this range a grid point might have no data neighbors at all and still obtain a prediction value on the basis of the correlation structure alone. This type of behavior is demonstrated in the Output 49.3.3, which shows a circular region in the center of the plot that has no data points. Predictions at the nodes in this area are mostly influenced by the covariance structure. 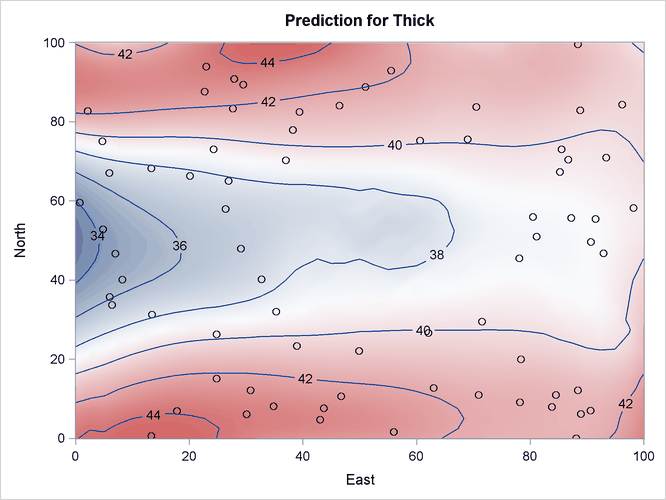 You can see the impact of this effect on the predictions if you compare the prediction contours in the Output 49.3.3 to the ones in Figure 49.4. Despite the contribution of the neighboring Thick data values to the predictions within the area of no observations, the outcome is clearly altered by the absence of observations at the locations , , and . A noticeable difference is also apparent in the plot of the prediction standard errors. Output 49.3.4 displays these errors, and you can compare it to the standard error surface in Figure 49.4. The comparison shows a slight difference in the color gradient within the area of the missing data values. Output 49.3.4 uses standard error contours to enhance the effect of this difference. The lack of information from the removed data results in an increase of the prediction uncertainty at the grid nodes that are most remotely situated from any observation in the central part of the domain. According to Output 49.3.4, the standard error at these nodes is almost comparable to the error observed near the borders of the domain, where the nodes of the prediction grid have relatively fewer data neighbors than other nodes in the domain. On a side note, PREDICTION plots display only observations with nonmissing values, as the plots in Output 49.3.3 and Output 49.3.4 demonstrate.